Latest News for the Official Jonny Quest DVDs from Warner Bros.
On this page we kept you all informed on the latest rumors concerning the official commercial release of the classic Jonny Quest TV series on DVD from Warner Bros as it neared release. We're preserving this as an historical archive; most of the information and links regarding the DVD itself have been moved to the DVD page. May 11, 2004 Released at last! Amazon tracks top selling DVDs on this page -- a check as of 10:50 p.m. EDT on May 11, 2004 (the first day the set was officially available) showed it rated at number 10! This is as high a rating as the collection received -- pretty heady stuff for a nearly 40-year-old cartoon! May 5, 2004 Review Copy Arrives! March 28, 2004 TVShowsOnDVD reported that Warner Bros. will be releasing single-episode DVD samplers of some of its TV series, including "The Real Adventures of Jonny Quest." Warner Home Video (WHV) opens its classic vaults to team up with legendary animation studio Hanna-Barbera to premiere two releases in the new "Hanna-Barbera Golden Collection" DVD series featuring the animated series "The Jetsons: The Complete First Season" and "Jonny Quest: Season One." By popular demand, both cult-classic cartoon series will be available May 11, 2004 for the first time ever digitally re-mastered on DVD in a deluxe four-disc collectors set, each featuring over 11 hours of classic original TV programming and newly-added enhanced content, priced to own at $64.92 SRP. Read about The Jetsons DVD. March 3, 2004 Thanks to forum regular "Curt in Houston" for noticing Amazon.com has the DVD collection up for pre-sale on their website. Amazon.com web site also confirms Tuesday, May 11, 2004, as the release date. While poking around the web, we found a large picture of the cover art on the DVDEmpire web site. Posted by Gord Lacey in this report on TVShowsOnDVD.com. [TVShowsOnDVD.com] reported this was coming awhile ago, but today Warner Bros officially announced that they are releasing the first season of Jonny Quest on DVD. On May 11th we'll see the entire 26 episode premiere season of the show released on DVD for the first time. With a running time of 676 minutes, and boasting "dazzling translucent collectible packaging," the set will carry a suggested retail price of $64.92 for 4 discs. The 26 episodes aren't all you'll get, as Warner Bros has a bunch of great extras lined up for the set. "Jonny Quest Files" will contain fun facts and trivia on the show, the "Jonny Quest Video Handbook" contains information on the heroes [and] villains. I read this morning on Coming Attractions (http://members.cox.net/comingattractions/) that a release date of May 12th has been set for the complete 1st season on DVD. This is my only source of information for this news, so a second source may be in order before you post this news on your Quest site, but it's worth looking into. JONNY QUEST SEASON ONE DVD SET - Coming in May! 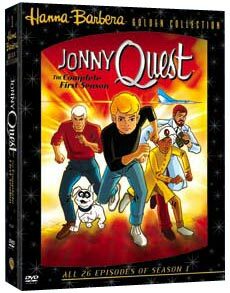 The JONNY QUEST SEASON ONE DVD Set is coming this May from Warner Home Video! Follow young, intrepid adventurer Jonny Quest, his scientist father Dr. Benton Quest, bodyguard Race Bannon, boyhood companion Hadji, and pup Bandit, in the globe-trotting, harrowing exploits featured in this DVD set collecting all 26 Season 1 episodes of Hanna/Barbera's 1964-65 animated classic! The March PREVIEWS solicitation indicates that this DVD set is scheduled to ship in April 2004. The retailer ordering data lists May 12th as the ship date. Yes, there will be a DVD box set of all 26 classic Jonny Quest episodes. Most probably by the end of '04. News we've all been waiting YEARS to hear. I and others were interviewed for a small retrospective documentary (which I hear came out great). Other extras MAY include, the Toby Danger short from Freakazoid and a vintage B&W PF Flyers commercial done at the time of the original show. I know they have access to both these things and I suggested that one or both should be Easter Eggs. We'll have to see. I asked about censorship (The infamous "Heathen Monkeys" line, for example) and uncut versions (unlike some awful VHS releases of the past) and, rest assured that they want to put out the truest versions from the archives. The two producers of the extras are big fans and very nice guys and the quality of the extras will be whatever they are allowed to do, time, money, and available material (The classic show wasn't that well archived). As far as I'm concerned, it is a MAJOR victory to have the episodes on DVD, period. Any extras will be welcome, but that's a minor point to me (even though I'm involved a little!). In addition to CJQ, first season sets of Flintstones, Scooby-Doo, and Jetsons are on the way and I know that they are working on a Challenge of the Superfriends thing. Also, they are finally talking about a good box set (or sets) of Batman: TAS. Sorry it isn't the best of info, but you can be assured that those bootleg sets are a waste of money. Within ten months' time, a much better quality, and less expensive official version will be easy to buy. January 14, 2004 Thanks to "tomahawktom" who posted this info on our forum, and to www.thedigitalbits.com for posting the information in the first place, even if they did misspell Jonny's name! A while back here in The Rumor Mill, we told you that Warner Bros. was finally going to get more serious about releasing their animated product on DVD, particularly TV series animation from their new and classic lines. Well, we've been hearing from some very good sources recently, who tell us that the folks at WB are hard at work on The Flintstones: Season One, The Jetsons: Season One and Johnny Quest: The Complete Series! That last title has us particularly excited here at The Bits. No release timetable has been set other than probably late 2004 or early 2005. Other full season animated titles are planned, we're told, including the recent Batman: The Animated Series and more. We'll post additional details when we have them.